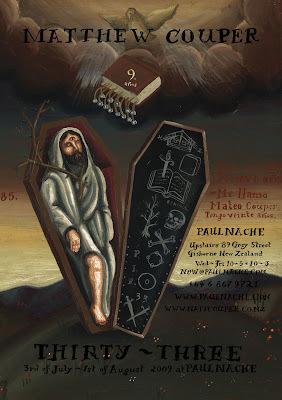 YOU ARE INVITED TO MY EXHIBITION, THIRTY-THREE AT PAULNACHE IN GISBORNE. THE EXHIBITION IS COMPRISED OF THIRTY-THREE NEW RETABLO-STYLE PAINTINGS ON TIN WHICH CATALOGUE EACH YEAR OF MY LIFE SO FAR. 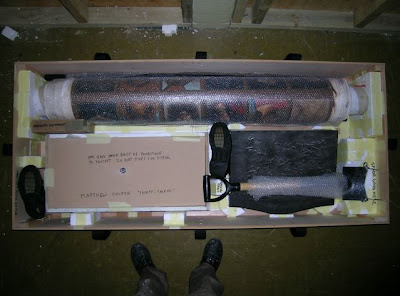 THE CENTRE-PIECE IS A LARGE PAINTING INSTALLATION, TITLED THIRTY-THREE, TWO DOUBLE-SIDED HANGING CANVASES, A FLOOR PAINTING AND ASSORTED OBJECTS. ALL THE RETABLOS WILL BE AVAILABLE TO VIEW ON MY WEBSITE EARLY NEXT WEEK. 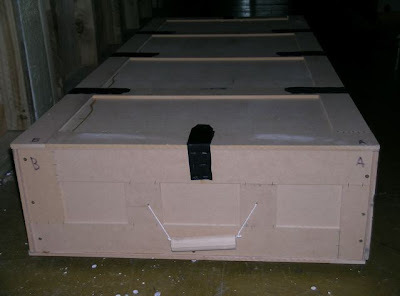 HERE'S SOME PHOTOS OF THE CRATE I'VE MADE. GOOD TO KNOW I CAN ACTUALLY MAKE PRACTICAL STUFF AND FOR VERY LITTLE CASH. 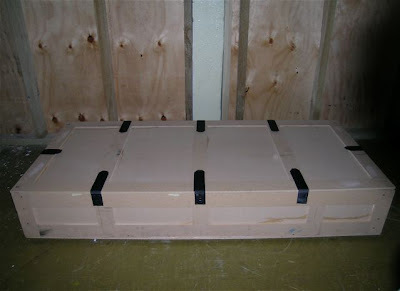 3X PLY PANELS, CUT TO SIZE=$27, POLYSTYRENE BLOCKS=FREE OUT OF LOCAL SKIP-BIN. VELCRO STRIPS=$7.90, MASKING TAPE=$10. GUN STAPLES AND GLUE=#24. A DAY AND A HALF TO MAKE (CUTTING, MEASURING, GLUING)=DUNNO. PRETTY CHEAP ALL UP. 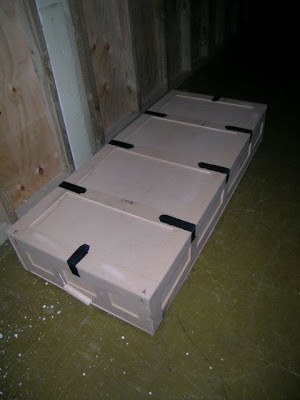 NEXT TIME, I'LL USE HEAVY CARDBOARD AS THE PLY IS A BIT WEIGHTY WHEN ALL THE ART IS STACKED IN THE CRATE.